This afternoon I performed my last filial duty and scattered what remained of my father’s ashes at the Taj Mahal in India. 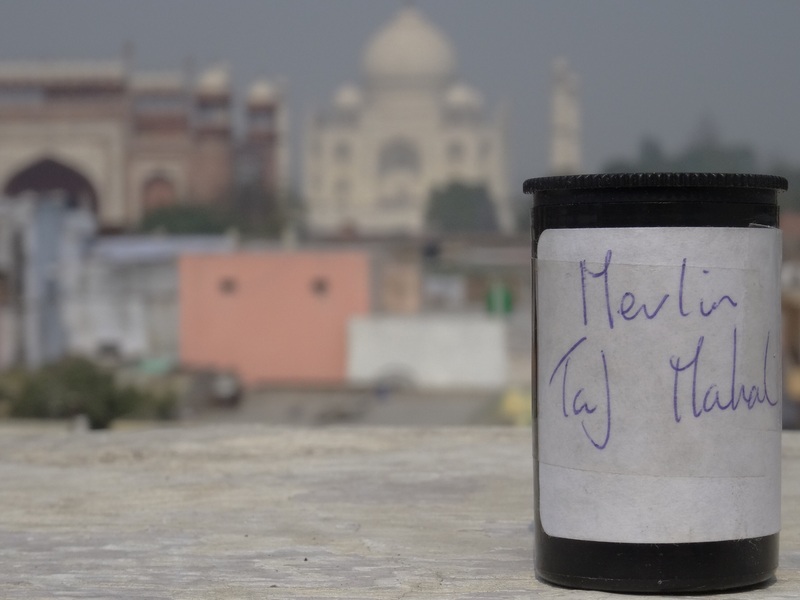 If you have read ‘Merlin’s Last Journey’ you will know what happened to the rest of his mortal remains and that the final instalment has been residing in a plastic 35mm film canister. That same canister then took a place in my wash bag and for over 2-months has been jostling around between the natural anti-insect spray and a tube of moisturising cream. We conducted a reconnaissance walk-by yesterday as security at the Taj has been beefed up considerably in the light of terrorist attacks. It all looked fairly straightforward but there were severe restrictions on what you could take in and a pretty thorough ‘pat down’ was being undertaken for all visitors. Thus, the canister had to go and the contents were transferred to a small re-sealable plastic bag. After discussion we decided that the best place to stash this, by now rather suspicious looking bag, was in the front of my pants. So, duly kitted out with the old man nestling safely out of sight and streamlined enough for the most inquisitive pat down we set off. A short queue and I raised my arms for the patting. Not a bead of sweat on my brow I stood like a Greek statue. Passed. Inside we enjoyed the spectacle in front of us. Tourist cliche though some may think it to be the Taj Mahal still has the power to stop you in your tracks. My favourite phrase, first read nearly 30-years ago, concerning its construction is ‘They built like giants these Pathans, and then finished their work like jewellers’. To imagine that it was conceived in the minds of men and then made real by millions of man hours is to marvel afresh at the heights that mankind has scaled. We made our way to the tree designated as the place and where Merlin had scattered some of his own mother’s ashes on his one and only visit here. There were a few heavily armed security guards strolling amongst the crowds and the small poplar tree was a good 6-feet away behind a wood and wire fence. We retreated to a quiet and deserted bench to formulate a plan. Stepping over the wire was out of the question as was throwing the ash from behind the barrier. It would have to be placed as close as possible without firstly, crossing the barrier, and secondly, without attracting any attention. The packet was carefully retrieved and I tipped the contents into my right hand. As we walked towards the tree we both watched out to make sure that the guards were nowhere in the vicinity. Even though I knew that I only had a handful of ash in my hand I felt a slight frisson of excitement and being involved in something a little unorthodox and illicit. We reached the spot. There were no guards nearby and a group of Indians were providing a good amount of cover. I knelt quickly and surreptitiously spread the ash along a row of white Alyssum. Standing up I spoke aloud a phrase from his will: “In this world of change, nothing which comes stays, and nothing which goes is lost”. I thought of him being there and of scattering some of his mother’s ashes and wondered how it had been for him. His mother, my ‘Nanna’, had been a wonderful woman who had spoilt us terribly when we were young and we had all loved her, as the very young do, in a very natural and unconditional way. Her death had been the first one I had dealt with and it had left a strong impression. It was very good to think of them both. I turned to look at the Taj, by now really starting to glow in the late afternoon sun, and thought ‘good choice Merlin’. 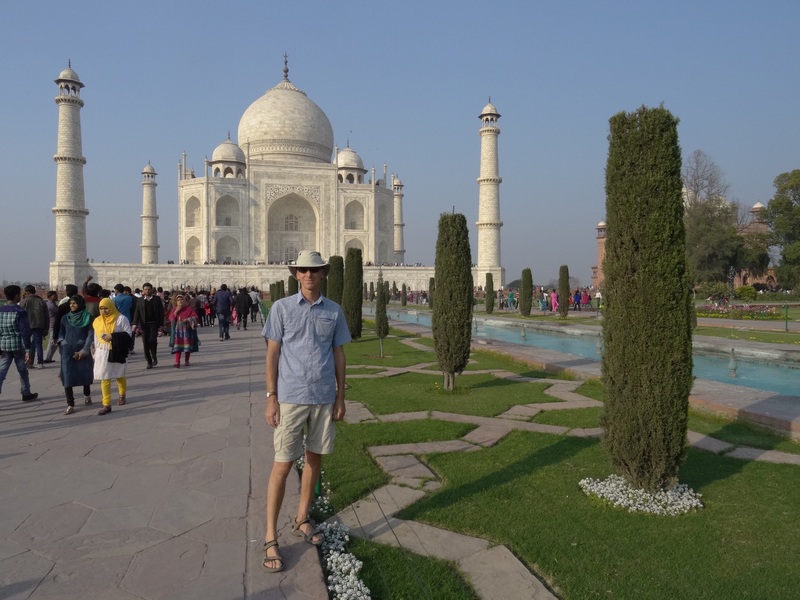 This entry was posted in India, Life, travel and tagged ash scattering, change, cremation, Father and son, India, taj mahal by Ashby's World. Bookmark the permalink. Amazing story, I am touched. Fantastic My Lord! Enjoying every word with lots of feeling and emotion. Bonne continuation.